As a devout meat eater, I can’t ever imagine not eating meat. There’s just something incredibly satisfying about its unique texture, enticing aroma and alluring taste. And like most meat eaters, I’ve probably eaten more animals than I can count. This fact, and my general pro-meat attitude, probably hasn’t won me many vegetarian friends. But for a meat eater, I am rather embarrassed to say that I know very little about all those different cuts of meat, where they come from on the animal and on occasions even the best way to cook it. Like most people I head to my local supermarket, pick up my packet of lamb/beef/chicken and think nothing more of it. Sometimes it’s not even organic or free-range. Oh if Hugh Fearnley-Whittingstall hears about this, he will certainly refuse to be my food hero. With news of the fourth National Butcher’s Week (13-20th March) arriving in my Inbox, I had an epiphany. I should, and need to, learn about those cuts of meat by exploring some of the best butchery classes right on my doorstep. After one or two train/tube/bus rides, that is. Parson’s Nose is very much the local butcher at the heart of a community. Well, two communities actually as they have a store in Fulham and one in Putney. Born, originally, out of the requests of curious regulars, their courses are still one on one sessions available during the day or in the evening by request. They can also be tailored according to your requirements so if you wanted to attempt a multi-bird roast, they can help you with that. I dropped in on their sausage making and combination courses. 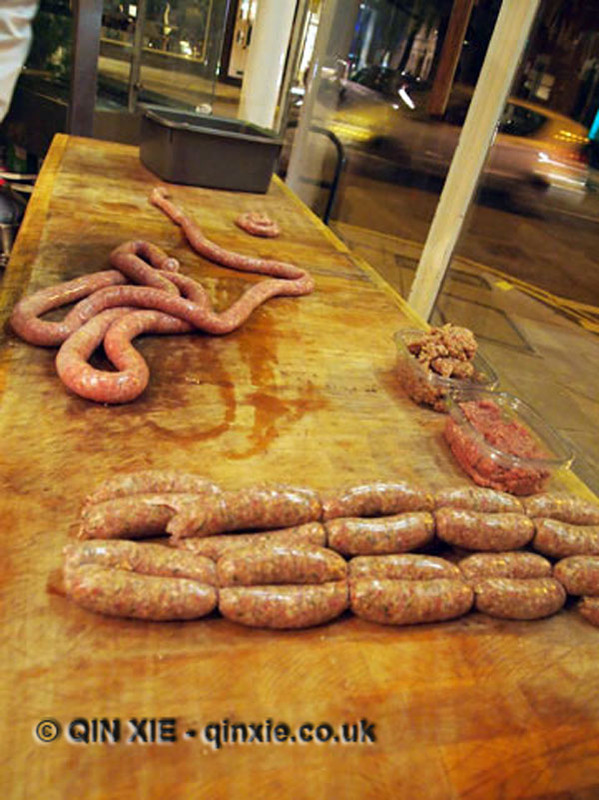 On the sausage-making course you are literally taken from start to finish by one of their butchers. That is, you begin with whole chunks of meat; go through the whole mincing, mixing and stuffing process; then finish with tying up the sausages yourself. You are taught through the techniques step-by-step as you make the sausage yourself and you definitely get your hands dirty. On the combination course, you have three different meats to prepare which in this case was chicken, shoulder of lamb and loin of pork. Over the span of three hours, or however long it takes, you’re taught through the different sections of the meat, how to cut it, cook it, and even how to roll it. For this course, you are shown how to do it at the same time as trying it for yourself. At the end of both classes, you get to take away all your prepared meats and any other special instructions. Take the sausage course for example, you need to leave the sausages for a while before tying it up to prevent a build up of fluids so you don’t actually get to do the tying in the class. But don’t worry, you are taught how. 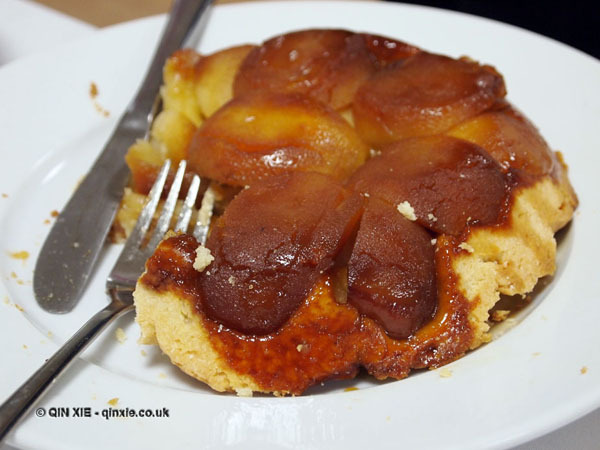 Leiths School of Food and Wine is famed for being one of the top London cookery schools where they train professional chefs as well as teach keen foodies. 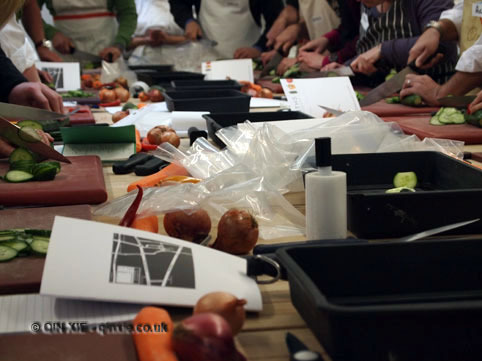 The Leiths class I went to was a knife skills course where you started off with vegetables and worked your way up to a whole meal over the course of three hours. The group of twenty gather around a large rectangular workstation where the teacher demonstrated the different techniques with different knives while talking through the ingredients. Then it was over to the class to do the hard work with their own set of ingredients, provided as part of the course. First up was the art of roll slicing vegetables with the likes of onion, carrot and cucumber to practice on. After the vegetables, it was on to the meatier task of filleting round and flat fish. 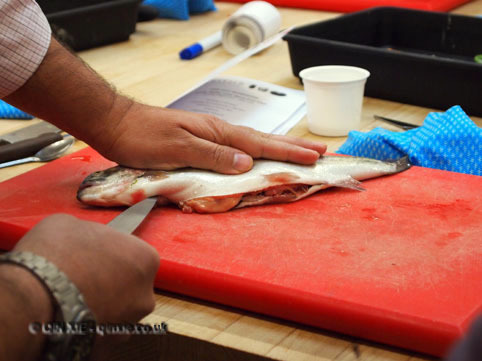 This offered an opportunity to learn about identifying different types of fish and how to gauge its freshness. The last thing on the agenda was chicken – the meat part. 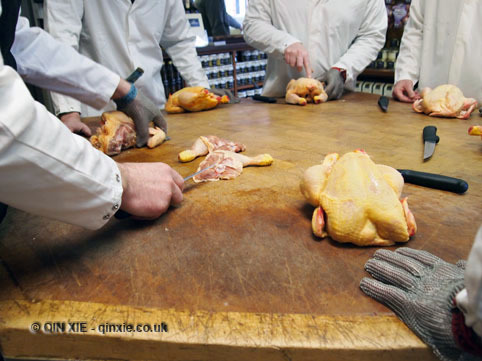 You are shown the different ways of jointing a chicken, including how to do a chicken supreme. You might think that with such a large group it’s difficult to learn anything with just one teacher, but there are also assistants who move around the workstation helping anyone who needs it. And as it was at Leiths School of Food and Wine, there were plenty of cooking tips being thrown in and of course recipes to take away at the end so you can make a meal out of the ingredients you prepared in class. That is, after your light lunch at the school. If you wanted to build on the skills learnt on this course, Leiths also hold a more advanced course with just meats where you can learn more butchery skills. Ginger Pig owns their own farm, that’s one of the first things they will tell you at their classes. 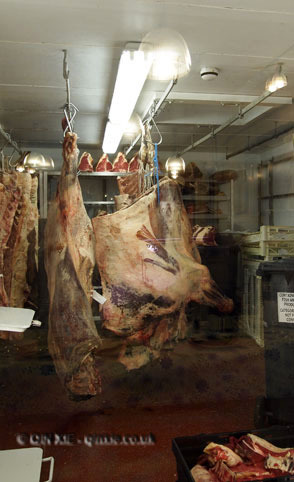 At the beef class, they will tell you about the different cuts of meat and the best way of storing and ageing it. This will eventually lead to you slapping the bit of meat that you’ve just cut. Yes, really! Because at the Ginger Pig, the courses are more than just learning about meat, it is also a bit of a quirky night out. After the theory at the beginning of the course, you gather around a butcher’s block and some lucky volunteer gets to carry a side of beef from where it’s hung to the table. If you’re feeling big and strong you also have the opportunity to hold up the beef at arm’s length, if that’s your thing. The main reason why you start with a side of beef is so that you can be shown the different cuts of meat from the ribeye down to the rump and how to break it down. And you get to taste the beef, mid-session, which is just as well because it’s hungry work. Everyone gets the chance to help breakdown the beef, as there’s four sides of beef for 14 of you. There’s a real sense of camaraderie in the air too as everyone is applauded for their effort in taking apart the beef, and for giving it a good slap. Of course that’s all just for fun. 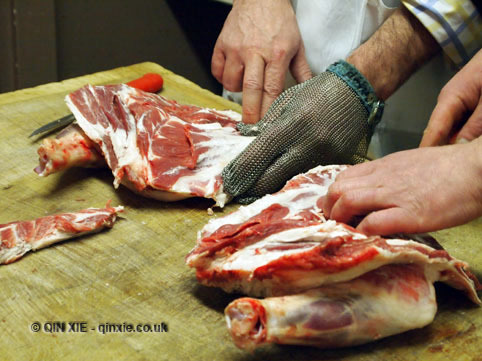 You are also given a section of chined rib to prepare your own roast beef joint, complete with a French trim. If, like me, you’re no good at tying knots then this will be enough to get you into a tangle. The course ends, three hours later, with a session on how to cook the joint of beef you’ve just prepared, but the evening finishes with wine and a meal cooked by the two butchers. For the beef course that’s a roasted joint of beef with Dauphinoise potatoes and salad, plus a bread and butter pudding. 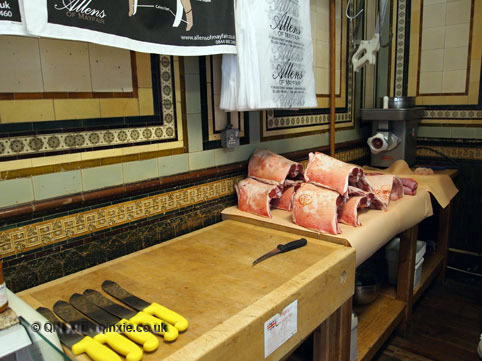 Allen’s of Mayfair are the oldest butchers in London and they supply meat to some of the top London restaurants, counting the likes of Bibendum, Scott’s and Le Gavroche amongst its customers. They’ve been running their butchery course for quite some time too; not as long as they’ve been open of course but long enough. One of their butchers will teach you, and four others, a thing or two about butchery at their bijou Mount Street store and you only need to give up an hour and half of your time. It’s practically do-able in an extended lunch session, except then you’d have to take a load of meat back to the office. Seasons change and so too does the meat you work with, but you will always have four different cuts to play with then take home along with some recipes. On this particular occasion there was a chicken to joint, an oxtail to cut, a pork belly to carve and a hunk of lamb to chop up. All the cuts are of a manageable size so you only get to learn how to dice up your section of the animal but you do get variety from the different meats. They only run the sessions on a Wednesday and with only five spaces per session, the classes are booked up months in advance. 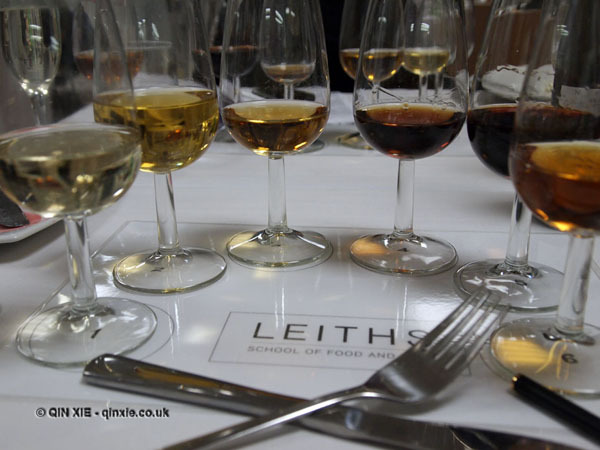 Leiths School of Food and Wine, famed for training professional and amateur chefs alike, has recently launched a new series of evening tasting classes. 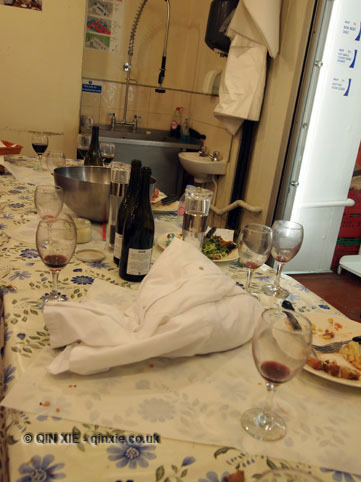 I went to its West London kitchen classroom to try some food and wine matches. 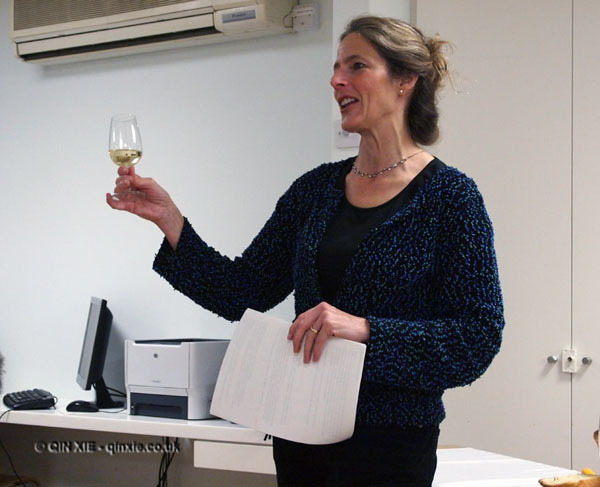 The class was fairly informal and led by Nancy Gilchrist MW – author, journalist and Master of Wine. For any worshipper of desserts, the evening promises to be enjoyable, entertaining and educational. Unfortunately the class took place when London was in the grips of icy wintry weather. Having braved the snow and ice with a questionable choice of footwear, which got me cursing every two steps, I was very well rewarded. We were welcomed into the class with a glass of Zonin Brut Prosecco, which given the warm embrace of the classroom, was like an injection of summer. As guests slowly trailed in, the hubbub in the class grew. Nancy introduced the format of the evening – there were six dessert wines to try with six matched desserts. There was brioche to cleanse the palate, water for rinsing and we could request a personal spittoon, if we wanted to. We also had a course booklet with notes on all the wines and recipes for all the desserts. It was a case of “you can take it as seriously as you like”, or just enjoy. 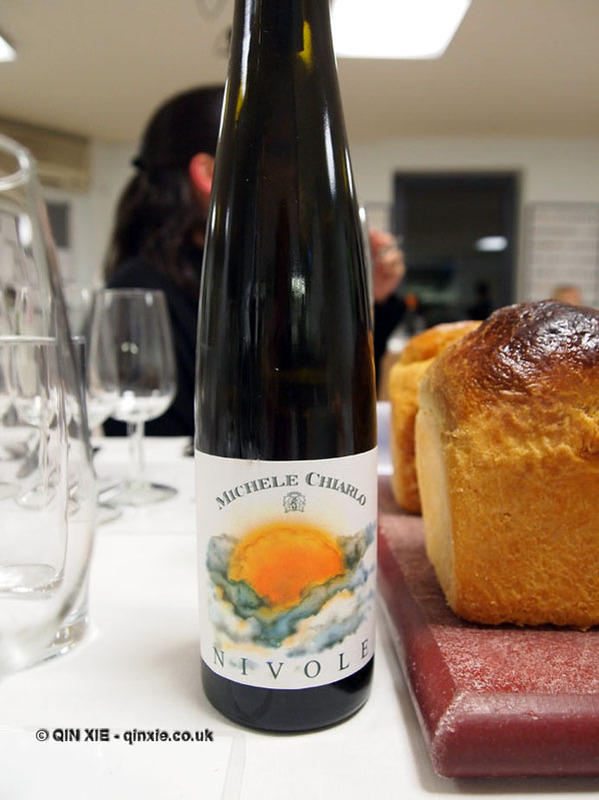 First up was a delightfully summery Chiarlo Nivole Moscato d’Asti 2009. At only 5% alcohol, it was the least alcoholic of the wines and also my favourite. It was matched with pomegranate meringues, pomegranate and strawberry compote and sweetened whipped double cream. Nancy suggested tasting the wine in four stages – on its own, with just the meringue, with the meringue and the compote and finally with everything. It was interesting to find that the perceived flavour profile of the wine was changing according to what it was paired with. The wine was very pleasant to drink to begin with and pairing with just the meringue seemed to make little difference. With the compote the contrast was a lot sharper and the wine, although not unpleasant, didn’t taste nearly as nice. When the cream was added though, the natural taste of the wine returned but with a new found richness. The second wine was Chateau Suduiraut Sauternes 2006 from Waitrose paired with crème brûlée and raspberry coulis. There was a hint of marzipan in the wine which worked particularly well with the caramelised sugar of the crème brûlée. This sweet wine is produced via a very labour intensive process as it’s made from grapes affected by noble rot. The grapes are infected by a special strain of Botrytis which causes them to dry out like raisins. They must be harvested at a particular stage of the infestation to produce the required characteristics in the wine, which means that each vine must be harvested several times by hand. Nancy tells us that this soft and mellow wine would also work well with foie gras or blue cheese. Wine number three was the Royal Tokaji 5 puttonyos 2005, which was paired with tarte tatin and Calvados crème anglais. Made with hand picked Aszu berries, the production of this wine is also highly labour intensive. The 5 puttonyos indicates the amount of berries added to the wine and therefore the level of sweetness. As the scale is between 3 and 6, this wine is very sweet. Next up was an intensely sweet Henriques & Henriques Single Harvest Malmsey Madeira 1998 matched with stollen. Sweetness is definitely a defining characteristic of dessert wines but this one was particularly so. It was very interesting to learn about how Madeira’s distinctive flavour was first discovered as a result of some wines being carried aboard merchant vessels making long journeys across the world. These days, instead of making that long journey, the wine is heated to around 50°C and maintained for some three months. Madeira is a fortified wine which continues to improve with age, is relatively insusceptible to oxidation and will therefore last for a long time. After that large dose of sugar, it was on to a slightly less sweet wine – the Les Vignerons de Maury, NV Solera 1928 Maury. This is another fortified wine but produced using a Solera process, where new wines are blended with older wines in rotating barrels, which began in 1928. It is a non-vintage wine as, in order for a wine to be deemed a vintage, at least 85% of the bottle must be wine produced from that vintage year. (Port and champagne must be 100%.) The dessert paired to this non-vintage was fig and frangipane tart to match the hint of fig and tobacco in the wine. Last but not least we had the Bacalhoa Moscatel de Setubal 1999 paired with a chocolate and mocha layered cheesecake to pick up on the hints of coffee. The evening wound down in the same relaxed manner as it began – guests were able to explore the different combinations of desserts and wines with Nancy on hand to answer any additional questions. For me though, it was a matter of stomping through the snow in an attempt to get home. After all, I now had renewed energy from all the sugar consumed to make the best of my impaired balance.